Siri will be more intuitive than ever, this is a promise from Apple. The current version is efficient enough, users can tell her to set reminders, to inform them about the weather, and she gives any information as long as the users are talking to her. If the users don’t request other information from her, she won’t know how to help you with other tasks because she doesn’t monitor your daily activities, like when you’re checking your Twitter feed at a certain hour to read the news, and she won’t know what time to check into your flight etc. Apple is about to change that with Proactive, which will have a friendly interface and which will be reachable with just a swipe. If you’ll need the assistant, you will find it anchored to the left of the home screen, while Spotlight will be situated at the top to search and launch applications easily. Before iOS’s major redesign, Spotlight was sitting to the left of the home screen. Beneath the search bar popups will be displayed with information from applications, maps etc. When you want to check a specific application or call a friend from the phonebook, ask Proactive’s help. Up until now, Apple has been acquiring small app developers and integrated core iOS applications, Proactive is the result of these previous actions. Also, the service will work with Maps application and will use an augmented reality interface to display personally relevant points of interest, in addition, it will integrate with a third party Siri API which was codenamed “Breadcrumbs”. Since Apple has no intentions to release Proactive with support for proprietary applications and data, it seems that developers will be allowed to integrate their apps into iOS’s search results and Siri, which will be as colorful as the Apple Watch interface. According to sources, Apple will introduce a scaled-down service for developers because of serious concerns according to which Siri will misinterpret words or contexts and will send personal data to other third-party applications, resulting in privacy issues. “Breadcrumbs” will be similar to the Google’s App Indexing feature and will allow Proactive and Siri to index parts of applications that have recently been accessed. For example, if you’re using Netflix and you prefer to watch a particular genre of movies, Siri will launch that section and you will have a list of movies from that category. Apple improved the Maps app and built its own Points of Interest (POI) system for Proactive, which will include two new features: “Browse Around Me” and an augmented reality view for local listings. The second feature allows the user to hold up their iPhones in the Maps app and point the camera toward a business (ex. : café) and get a virtual view of menu items or daily specials on their screens. We talked enough about Apple’s new Proactive project. Google is aware of the “danger” that’s coming from Apple and won’t sit with its arms crossed and accept defeat. The upcoming Android M will take Google Now to a new level, making it a core part of the OS. So, when Android M is be released, users will be able to tap and hold the home button to enable “Now on Tap” and instead of appearing like a full-screen application, it will feature a card-like interface that will sit above every open application. So, when the user is hungry, they can ask Now on Tap to give them info about a restaurant that has been mentioned in their friends’ messages. Also, when a friend mentions a movie title, Now on Tap will come with a card with reviews, information from applications such as IMDB or Flixster and will give a link with the trailer. Also, the users will ask Google to give them information about bands, will tell them who is the leader of band “X” etc. iOS 9, Google Now and Cortana will have these mutual features: Calendar Integration, Location-based reminders, Nearby Places, News, Traffic suggestions; Voice search, Unit conversion and Weather. 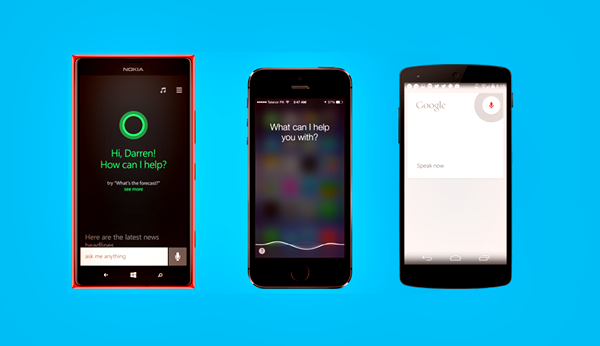 Caller ID is supported by Google Now and soon by iOS 9, as well, while Cortana offers Contact-based reminders. You will get suggested applications and contacts only on iOS 9, but the new operating system won’t have third-party app integration.